Watching Rob Wood and Sam Felton from the Wyss Institute at Harvard explain the power and the glory of origami robots brings on some serious chord changes in one's lyrical thinking. On the surface of things, where most of us live, one wants to rejoice at the exquisite beauty of origami robots assembling themselves, white angular sheets rising, like the Sydney opera house now but then transforming into a weird albino stick insect, twerking their little battery packs and walking away, as if nothing just happened. It was like when I first read about 3D printers, parsing all the gushing wows, here we go high in the saddle cowboy smiles, giddyupping down the light fundongo, gleefully fleeing the Big Bad Bang and horsing along to the mother-of-all-things Singularity. All was blissful thinking. I'd like to live in a world where I could give a gift to Maybelline, who I so love, a gammy 'gami bot that folds in and struts up, over and out, and becomes a little whirling dervish of dazzling delight that lights up my lover's eyes, like a ditzy Dumbledoris with an electric, buzzing wand she knows just what to do with. I'd like to think that such origami lovelinesses would have an affect akin to the Gay Bomb which, when sprayed over the battlefield turned men from black-and-white thinking warriors, all grim and grimy, to pink sunlit soldiers of love. (Happy kenning fjorder, ja?) Going to war would have a whole new moaning. Also, I'd like to teach the world to sing in perfect harmony"
But the problem is, when these blokes begin discussing potential applications for the little origami robots that could, I got a feeling of dej vu. To a new agey soundtrack we are treated with images of cute paper origami figures, then insects, then proteins chains, then a flower unfolding, all inspirations for the robot design, the blokes say, and then Rob goes and spoils it all by saying something stupid like, "We thinks these structures will be deployable in harsh environments, like space and the battlefield," and suddenly the air goes out of my condom and I'm feeling like I'm a philosophy student back at the Rensselaer Polytechnic Institute on the day the Challenger shuttle exploded, all the engineering shop talk centred on "O" rings, no one talking the lost shuttle crew, although CNN kept flashing a still photo of Christine McAuliffe, the first teacher in space (in staff rooms across America, you could hear colleagues going, "Well, that fackin' figures. Get a teacher in space and, wouldn't you know it, her chalk ride snaps against the blackboard firmament."). Suddenly, I could envision self-assembling colonists on distant planets getting all bolshy with the green gawky inhabos ('Yo,' they'd be saying, with digital voices, 'extra-terra nullius, slimefucker, now cough it up and move along.') and ironclad dickheads duking it out on endless plastic battlefields like the Rockem Sockem robots of yore. 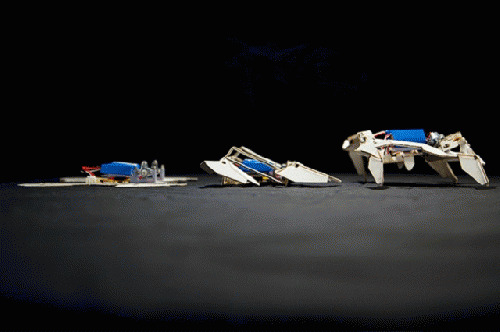 Worse, because I do too much reading, I could recall that these origami robots actually originated with DARPA, the research and development strong-arm of the US Department of Defence. Of course, DARPA being DARPA, they've gone down the road to excess once more (without finding the palace of wisdom -- yet again) and created not just origami-flavoured self-assembling bots powered by puffs of air, but what's more -- squishable shape-shifting robots and all manner of morphers. Well, of course, it's all part of that new Grand Narrative that says technology will be our Saviour, that climate change, melting ice caps, over-population, dwindling resources, endless war, arseholes in charge, the 1% certifiably insane -- all need not be worried over, because DARPA's on its way. We will all live longer lives, we'll end poverty as we know it everywhere, world peace is just around the corner, yada-yada-yada. I don't mean to be the dark side of the moon to this stunning neo-Enlightenment, after all, I've been a techie (albeit, not a very competent one) and I have a certain degree of Buddhist geekery in me -- I'm not, in principle, even athwart the Singularity and the merging of the digital and the human to some degree. But what reason does the common person have to believe that the coming transformative technologies will make us any better humans than the introduction of the toaster did? (Sheet, the white bread is still in control, y'all.) Why wouldn't the fat cats of the 1% merely horde and use these technologies they bankroll and control for their own nefarious purposes? Inbreed like Rubik's cubes of Oedipussy. Create gene-specific plagues for fun. And sh*t.
John Hawkins is a freelance writer from Boston. While he focuses mostly on fiction and poetry at the moment, he also writes political essays and book reviews. His work has appeared in publications in Australia, the US and the Czech Republic.